No fewer than 15 races will take place at Croft Circuit this coming weekend (23-24 July) as part of an energetic programme of top-quality club racing action for saloons, single-seaters and sportscars. The North East’s premier motor sport venue just outside Darlington will host a national championship fixture for the famed British Automobile Racing Club (BARC). Seven different categories offering huge variety will be in action in a succession of 15-25 minute races to guarantee two days of fast-paced entertainment for the public. In total, more than 150 drivers are set to take to the track over the weekend. Headlining is the Darlington & District Motor Club’s thriving Northern Sports & Saloon Car Championship which alone has attracted an oversubscribed entry of 50 competitors. This has led to organisers splitting the field into two grids to accommodate numbers at what is the championship’s ‘spiritual home’. Also on the bill is the high-profile Protyre Formula Renault BARC single-seater series as well as Honda V-Tecs, MGs, Sports Saloons, the visiting Scottish Motor Racing Club’s Ford Fiesta championship and a grid of ‘leaning’ Citroen 2CVs! The iconic and much loved French cars will be in action three times over the weekend – in two short sprints counting towards their own championship plus, on the Saturday evening, a mini two-hour endurance race featuring driver-change pit stops. One to watch will undoubtedly be ‘racing maestro’ Jeff Wilson. 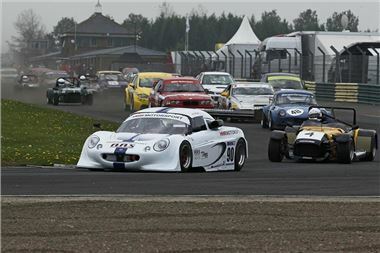 The 63-year-old from Newcastle-upon-Tyne, who has achieved countless race wins and titles during his lengthy motor sport career, is unbeaten so far this season in Northern Sports & Saloons with victories in each of the four races he has contested in his spectacular 170mph Lotus Elise (pictured). Not only will Wilson be looking to continue his winning ways, but he’ll also be going for gold in the 2CV enduro. Despite his four wins, Wilson is some way behind in the drivers' standings after missing two races. Leading overall thanks to wins in his class in all six races to date is Mike Cutt, from Strensall near York in his BMW. Cutt said: “I need to keep my consistency going – I’m only two points ahead and there are some other very strong contenders in some of the other classes who also keep winning so it’s important that I keep racking up maximum scores.” Among those seeking to close the gap to Cutt is the reigning Champion Paul Moss from Darlington – he’s back in sixth in the table after losing ground in the opening round with a mechanical problem with his Citroen Saxo. This weekend’s on-track action at Croft Circuit begins on Saturday with qualifying sessions for each of the categories from 9:30am, followed by five races starting at 3:30pm. Sunday’s schedule starts just after midday and consists of a further ten races. Tickets cost just £12 per day (payable on the gate) with admission for accompanied children aged 15 and under FREE. Car parking is also free and all admission includes access to the race paddock, enabling the public to get a close-up look at the cars and to chat to the competing drivers. Photo above by Tony Todd shows Newcastle-upon-Tyne's Jeff Wilson leading the Northern Sports & Saloon Car Championship grid at Croft earlier this year in his mighty Lotus.